One fine, rare day I was allowed to go home from work early. By early, I mean 3 hours early. When you work 12 hour shift, that’s a big deal! It took me twice as long to get home with all the new fallen fresh snow, but that’s besides the point. I got home mid to late afternoon and I was hungry. I knew I had a fresh container of hummus in the fridge, I just needed something to dip in to it. Bam! 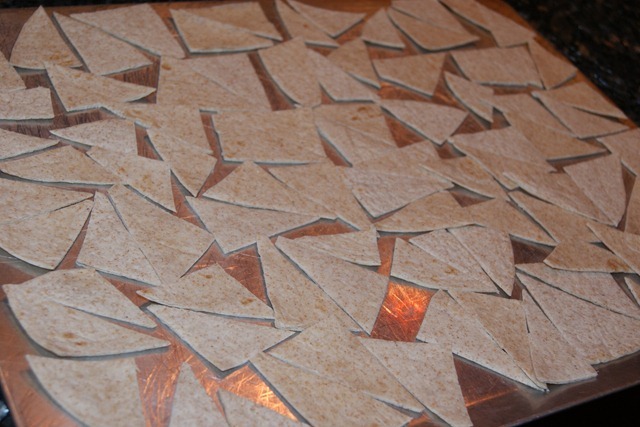 In comes the idea to bake some tortilla shells into crispy tortilla chips. Bite-sized wedges for easy eat-ability! 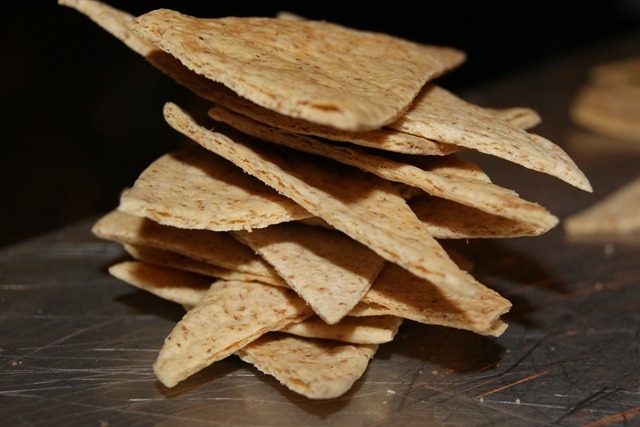 The warm crispness of wheat tortilla chips = so good! 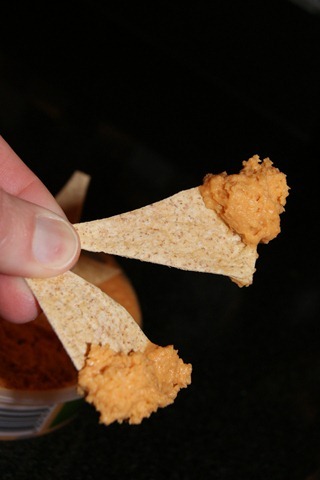 Yummy red pepper hummus and crispy baked tortilla chips! I’ve got some chips leftover and perhaps I need to make more of this Santa Salsa to dip them in! Have you ever roasted chickpeas? I did and they were so scrumptious! 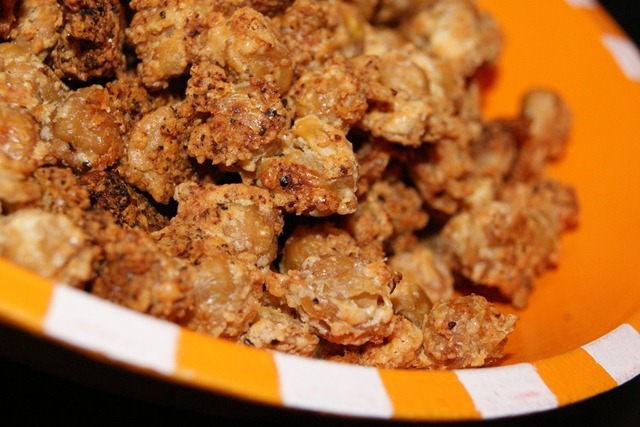 See the recipe here for Crisped Parmesan Chickpeas. 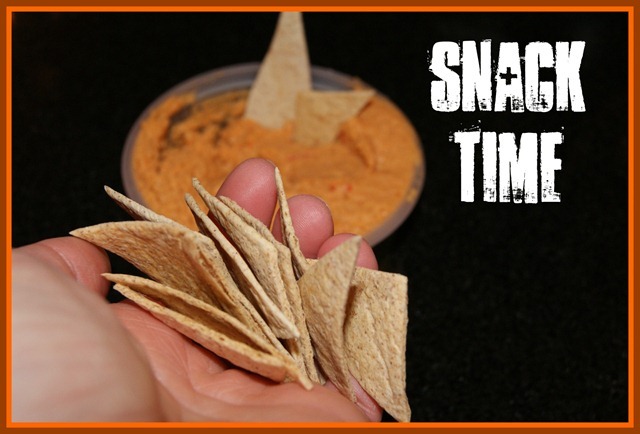 What is one of your favorite savory snacks? 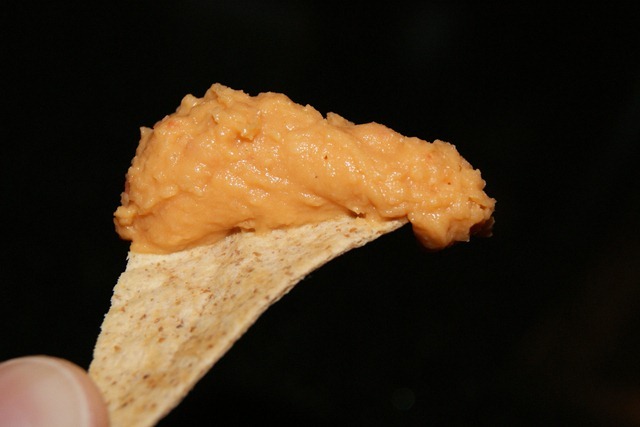 Have you ever tried pizza flavored hummus? It is so good! 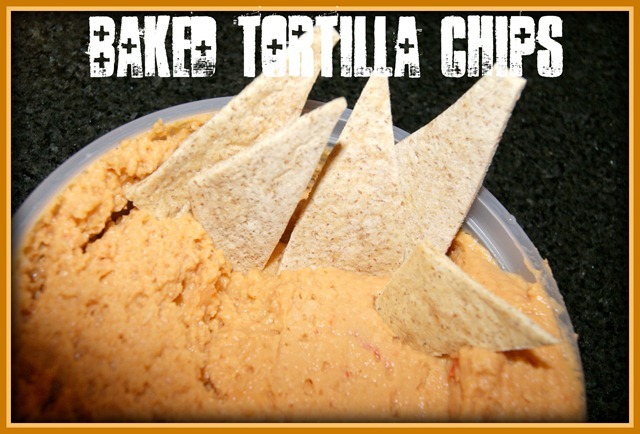 This entry was posted in Deliciousness and tagged baked tortilla chips, Hummus. Bookmark the permalink. Pizza hummus!!! Is that a dream come true? 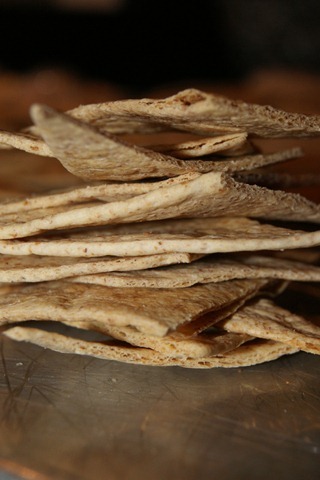 I love baking tortillas for a snack because you can make them sweet or savory. My favorite snack is pretzels with hummus! Pizza Hummus is TRIBE brand. Wow that a great idea. I never even thought to roast tortiallas to make chips. It’s so easy even I can do it ha. I love it too Hollie! yum! i love homemade chips. so easy!! Homemade toasted pita chips taste so good! Great post! 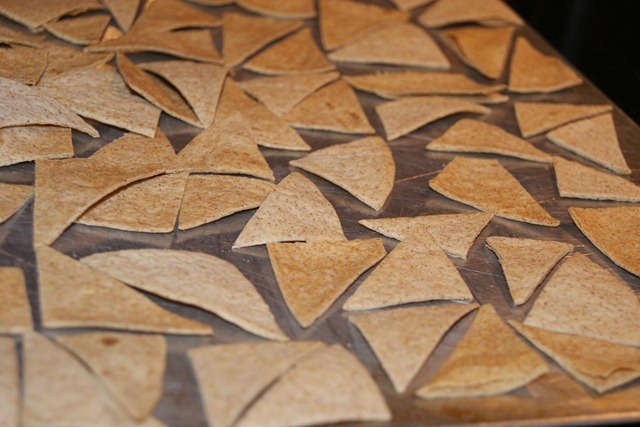 Matthew loves to bake tortilla shells like this for his chips. My favorite snack is cheese and crackers. I love all the Laughing Cow cheeses. I really like the pizza hummus but dessert hummus is my my favorite hummus!!! I love Crazy Camel dessert hummus too! I tried to get pizza hummus at Marsh Wednesday but they were out! Mmmm I may try this with some corn tortillas I have left over from making Chicken Enchiladas last weekend! 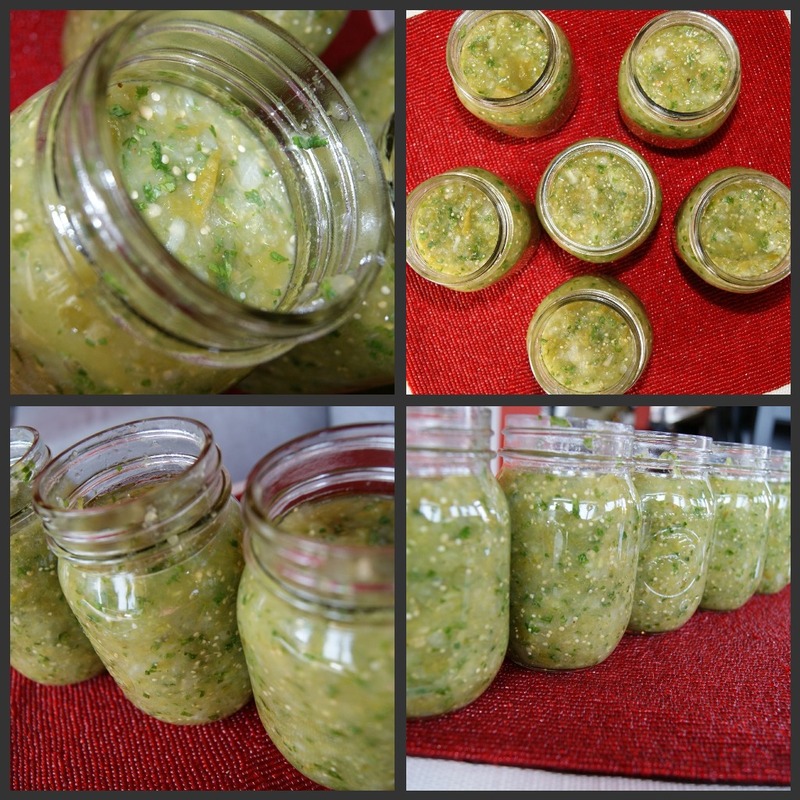 Kaitlin, I love your idea of thinning out hummus for dressing! 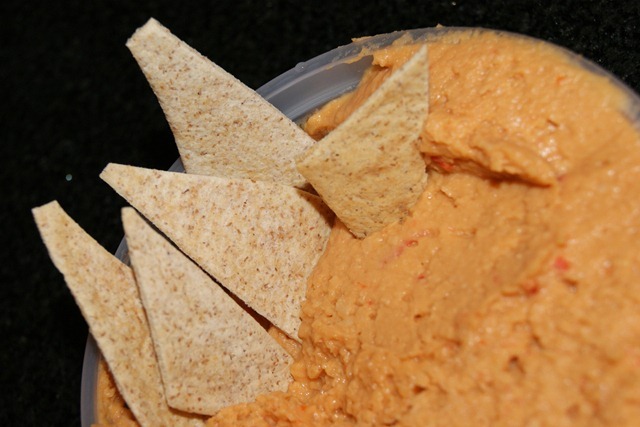 Roasted red pepper hummus is my favorite! I’ve never tried the pizza flavored one but I’m sure it’s delicious! Pizza hummus is TRIBE brand, hope you find it. I think I have been living under a rock. Pizza hummus! I will definitely be getting this asap. Thankfully, I was already planning on going to the grocery store today!!! Britt, the pizza hummus is by TRIBE, good luck finding it. And my other favorite is TJ’s guacamole hummus! Pizza hummus sounds too good to be true!!! I would love it! I also need to start making my own chips asap! I bought some yesterday that I hated and thought that it would be just as easy to make at home! Thanks! You are welcome! I love TJ’s guacamole hummus and TRIBE pizza hummus. I love making my own chips! I especially like sprinkling Splenda and cinnamon on them and using them to eat fruit salsa! Yum! I love fruit salsa. THat’s a great idea to make cinnamon chips! I love baked tortilla chips. Sometimes I’ll make em sweet and add cinnamon and splenda. They taste incredible. Jenny, I’d love sweet chips with fruit salsa! 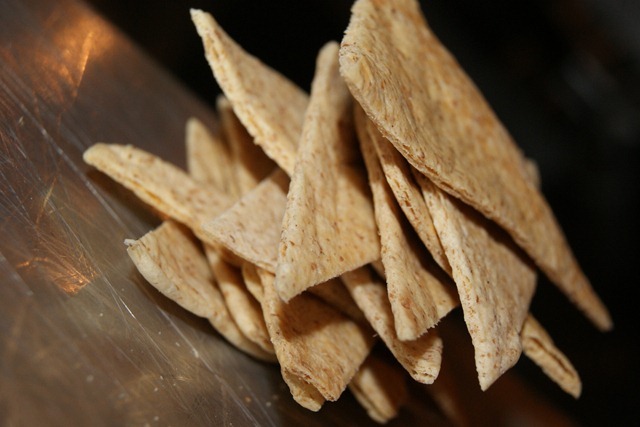 Hello twin–I just made baked tortilla chips the other night and made some nachos with them! So easy and simple, I love it!!! 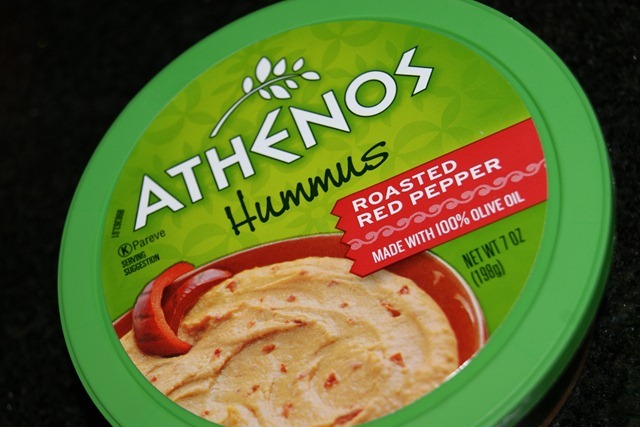 Hold up, they have pizza flavored hummus? Is that a joke?? I hope not because I need to find it! Tiffany, the pizza flavored hummus is TRIBE brand. 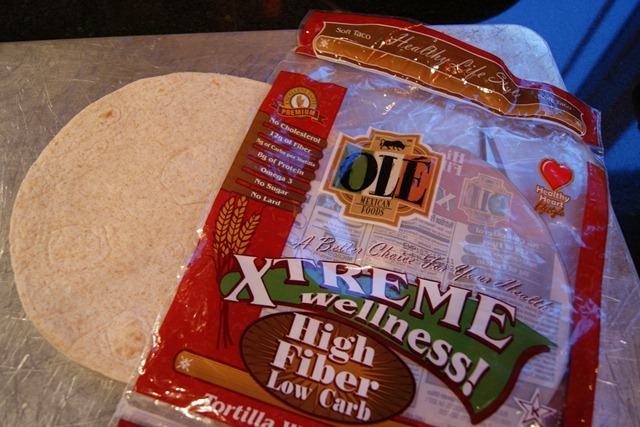 Awesome idea baking tortillas, I need to try that. I also need to try roasted chickpeas after seeing so many great recipes – yum! SUCH a good idea…as usual! 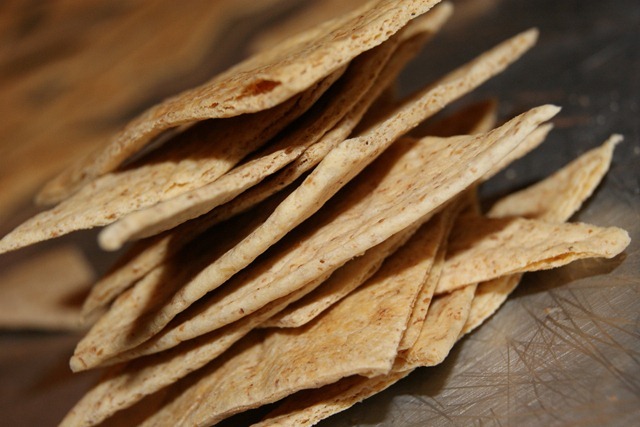 I love making my own baked tortilla chips! I hate the overly salted prepackaged kind. My favorite savory snack at the moment (I go through phases) is a Lundberg rice cake topped with sunflower butter and sweet mini peppers. 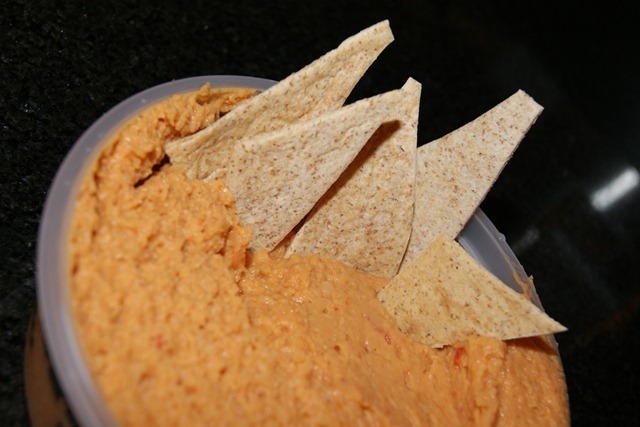 I’ve never seen the pizza hummus…I might just have to make some of my own! I just made some roasted chickpeas similar to Mama Pea’s pumpkin spiced ones and they turned out great, but I’m really curious about this crispy version of yours! I’m gonna go check it out! The crispy parmesan chickpeas are wonderful. Pizza hummus is TRIBE brand, but I am sure you could make your own too! Those chips look so delicious!!! Katie, they are light and airy! I love baking my own tortilla chips! I think they are sooo much better than any store brand I have ever had. Atleast they are healthier than any store bought ones I’ve had!